"Am I to understand that there is to be a burqa box now?" Australia's Parliament House has brought in new rules that will see people with "facial coverings" made to sit behind glass to view proceedings. The "security modifications" were made on Thursday amid a debate over the burqa in Australia. People who wear facial coverings into parliament will only be allowed to sit in the glass enclosed galleries. The new rule says that to watch parliament, people with "facial coverings" will now sit in enclosed galleries where schoolchildren watch behind glass and under guard. 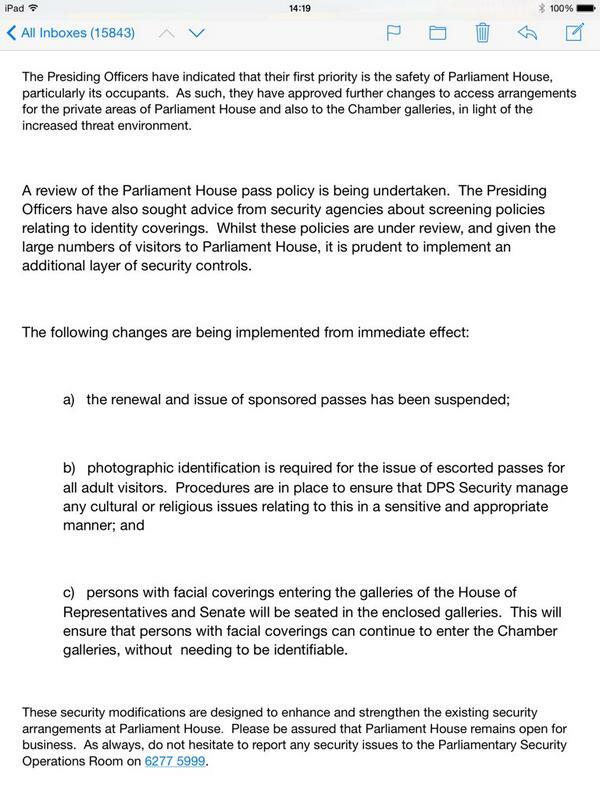 "This will ensure that persons with facial coverings can continue to enter the Chamber galleries, without needing to be identifiable," the department for parliamentary services said. A spokeswoman for Parliament House told BuzzFeed News that both women wearing burqas and niqabs would likely be targeted by the new rules, but "it's not religious, it's about any veil". Tension over banning the burqa in parliament increased when prime minister Tony Abbott said he was "uncomfortable" by the burqa and that he wished it was not worn in Australia. The newly appointed Australian federal police commissioner, Andrew Colvin, said he would not be drawn into a debate about banning of the burqa, but that state policing legislation gave officers around the country enough powers to legally identify niqab and burqa wearers. Government MP Cory Bernardi wholeheartedly endorsed the move. However, there was also an immediate backlash. I wonder if beards fall into the category of "facial coverage". Am I to understand that there is going to be a burqa box now? Get ready ladies because if you&rsquo;re a Muslim, there&rsquo;s not just a glass ceiling, you get a whole box! Get ready ladies because if you’re a Muslim, there’s not just a glass ceiling, you get a whole box! Greens leader Christine Milne labelled the decision "disgraceful". One of her Greens colleagues said it risked "Muslim apartheid". Greens Senator @RichardDiNatale on the DPS ruling dealing with burqas: "We&#39;re at risk of creating some form of Muslim apartheid right now." Greens Senator @RichardDiNatale on the DPS ruling dealing with burqas: "We're at risk of creating some form of Muslim apartheid right now." Australia's human rights commissioner disagreed with the decision. Australia's race discrimination commissioner also condemned the move. Independent former MP Rob Oakeshott saw the contradiction in the decision. PM wishes burqa wasn&#39;t worn in Australia b/c he thinks it lessons the status of women. The fix? Make the women sit up the back behind glass. PM wishes burqa wasn't worn in Australia b/c he thinks it lessons the status of women. The fix? Make the women sit up the back behind glass.